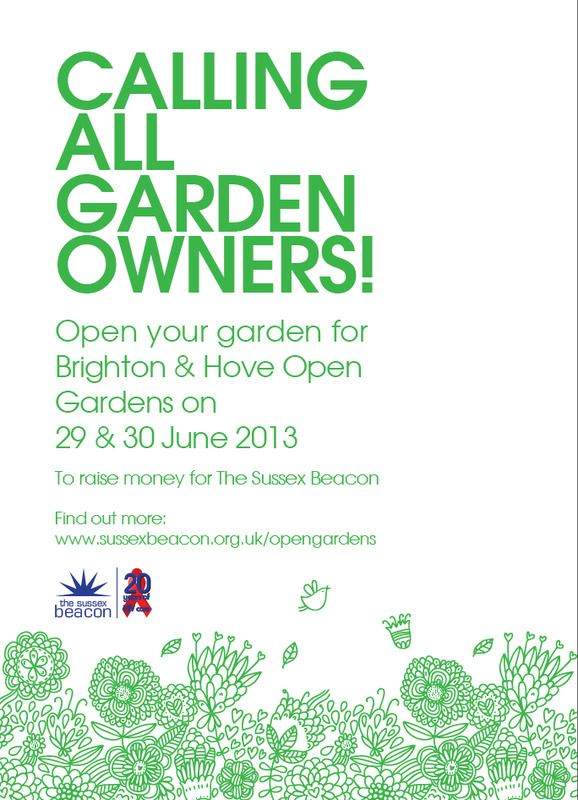 We are looking for allotment holders, garden owners and community spaces who may wish to open their gates for the Brighton and Hove Open Gardens 2013. This event has been rebranded from the former Garden Gadabout and is a hugely popular event in the Sussex Calendar. We are registering lovely private gardens, allotments and community spaces and wondered if you may have a garden or a space to open, or know others who do. Last year we had over 65 gardens opening for us and we are aiming to increase on this for 2013. Brighton & Hove Open Gardens will take place on 29th and 30th June from 11am until 5pm. Brighton and Hove Open Gardens raises vital funds for The Sussex Beacon, a clinical care centre for men and women living with HIV. The Sussex Beacon has to raise 50% of its income through fundraising. It costs approximately £1.8 million per year to maintain our current service levels. We rely heavily on fundraising and the goodwill of our local community to raise the funds needed. We are making this year’s Brighton & Hove Open Gardens a special and splendid event and we would love garden enthusiasts to join the event and make it a real success. Whether you are new to gardening or an old hand, you’ll find inspiration and ideas by the shovel full. From cool contemporary spaces to tranquil havens of wildlife – the imaginative use of small space to spectacular sweeping grand design, there really is something for everyone. As well as enjoying some gorgeous green spaces, visitors can relax and unwind with a cuppa or enjoy a bite of lunch, or browse for some bargains. The Sussex Beacon’s own beautiful hilltop gardens will be opening as part of this event. There will be activities for children, sales of arts and crafts and plants as well as delicious teas and lunch. There is lots on offer and full details can be found in this year’s Brighton & Hove Open Gardens brochure available from the beginning of May. You can pick up your copy from The Sussex Beacon Charity shops, in local shops, libraries, garden centres and cafes or download from our website. All money raised goes to support The Sussex Beacon’s Appeal www.sussexbeacon.org.uk. Sales of plants, items, delicious teas and lunches, and exhibitions of art work available at various gardens. Check www.sussexbeacon.org.uk/opengardens website for full details. It costs just £10.00 weekend ticket for entry to all the gardens and Weekend passes will be available from the Box Office at The Brighton Dome, and from The Sussex Beacon charity shops in Brighton.